Towns across central Maine are preparing for the loss of municipal revenue sharing from the state by passing the burden on to taxpayers, withdrawing from the undesignated fund balance or cutting services. The state budget battle has forced Fairfield and other communities throughout central Maine to deal with looming cuts to municipal revenue sharing, a scenario many town leaders hoped wouldn’t happen. Less than two weeks before a potential state shutdown created by an ongoing budget battle between Gov. Paul LePage and state lawmakers, towns are deciding whether to raise taxes, cut services or raid their surplus funds to meet projected budget gaps. In order to meet tax commitment deadlines, some towns are scrambling to solve the problem of large budget gaps without dropping a last-minute tax increase on residents. In January, LePage proposed that municipal revenue sharing be eliminated as a strategy to help balance the state budget, raising an outcry from municipalities that have relied on the funding since it was first mandated by law 40 years ago. In the months that followed, towns were forced to craft budgets without knowing what state money, if any, they could rely on. Rather than assume a dramatic revenue loss, many towns built their budgets based on the same level of state revenue that they got last year. Towns got a dramatic wake-up call last week when the Legislature approved a budget that still included significant cuts to revenue sharing. LePage has said he will veto the bill, and if the Legislature does not override it, the state could go into a shutdown on July 1. If the budget is amended to arrive at a compromise with LePage, it is unikely to include more money for revenue sharing, and it could even include more cuts. The cuts are an acceleration of a troubling four-year trend that has deprived municipalities of revenues that they are guaranteed under state law, said Geoff Herman, director of state and federal relations for the Maine Municipal Association, which provides legal and advocacy services for Maine’s towns and cities. Herman said the state lived up to a mandate to share 5 percent of Maine’s sales tax revenues with local communities for 36 years, but that has stopped. Communities should be getting a total $140 million, according to the MMA. This year, the amount was $100 million. The $65 million in the budget on the governor’s desk would reduce funding to 1989 levels. “We’ve gone back a quarter of a century,” Herman said. Fairfield is one of the few towns that prepared by crafting a budget that assumed there would be a revenue loss. The town got $727,000 last year, and officials built the new budget on an assumption that it would receive $660,000. That assumed number was “a shot in the dark,” Town Manager Josh Reny said. The shot missed. The town will receive $483,032 under the new state budget, a loss of $243,242 from last year. The planning and some carryover money has helped, but Fairfield still must address a $150,000 hole in its $5.4 million budget. That’s a gap Reny said will slow the town’s path toward financial stability and threaten services not only in the coming year, but after that. Towns are required to report tax figures to the state in weeks, Reny said. “We’re too late in the process to spend the time that would be necessary to go through every single line item in the town budget,” Reny said. “They wanted to make sure that the town’s share of taxes did not increase,” he said. The town is holding a special town meeting at 7 p.m. Monday to consider blunting the impact of the revenue loss with a $150,000 withdrawal from the town’s undesignated fund balance, sometimes referred to as the surplus account. Reny said the town has been trying to build the surplus in recent years. The account was $26,000 in arrears five years ago, but has increased each year since. An audit a year ago found the balance was at $1.1 million, and Reny said he’s expected a scheduled June 30 audit to show a balance close to $1.5 million, the amount recommended by the auditing firm. A $150,000 withdrawal would slow, but not reverse, the effort to build the balance, Reny said. While building the surplus to recommended levels, the town’s budget has remained flat or been reduced for four consecutive years. The use of surplus money will address the gap for the upcoming year, but Reny said Fairfield’s residents, like many across the state, will have to make difficult decisions in the future. Reny said that already, at current funding levels, the town is on a 15-year replacement cycle for town-owned vehicles and a 50-year rebuild cycle for roads. Communities throughout Maine are taking different strategies to combat the revenue losses, which vary widely depending on how much aid the town receives under state funding formulas. The formulas take factors such as town size and amount of tax exempt properties into account. Some communities, like Augusta and Farmington, are doing the same thing Fairfield is, and tapping undesignated fund balances, a strategy that gives them a year to come up with a more permanent solution. Augusta City Manager William Bridgeo said he will probably recommend that the City Council fill its gap of more than half a million dollars by drawing down that fund balance. He said the following year’s budget could include major cuts to services and staff. Farmington will also use money from the undesignated fund balance to temporarily offset a $190,305 loss. Town officials maintained throughout the discussion at the June 9 selectmen’s meeting that while the new state budget may not technically raise state taxes, it will result in higher local taxes. Other communities, like Waterville and Benton, are passing some of the pain along to local taxpayers. Waterville will lose $548,080 in revenue sharing, which has led city officials to propose a budget that includes a $1.75 increase in the city’s property tax rate, currently $25.65 per $1,000 worth of assessed valuation. If passed as proposed, a person who owns property worth $100,000 and paid $2,565 in taxes would pay $2,740, or a $175 increase. The proposed budget also includes a wide range of service cuts, including paving projects, public works funding and education spending. Benton will lose $36,085, an amount that Richard Lawrence, Benton’s treasurer and tax collector, said will be passed entirely on to taxpayers. The impact on the property tax rate is 20 cents per $1,000 of assessed valuation. “If we don’t get it from the state, we have to get it from the town,” Lawrence said, echoing what other municipal officials have said. He added that the level of funding the state provides to the school district will determine the final impact on the tax rate, currently $12.90 per $1,000 of assessed valuation. Some communities, such as Oakland, Gardiner and Pittsfield, are considering cutting services. In Oakland, which will lose $119,919, Town Manager Peter Nielsen said the Town Council will meet to decide how to respond to the gap. Previous discussions have revolved around delaying planned road repairs, a scenario that he said is better than losing staff, he said. The town has approved five road projects for a total of $280,000, a funding level Nielsen said would not keep pace with deteriorating roads even without the cut. Gardiner will get $413,953, a loss of $208,456. City Manager Scott Morelli said the city is facing a $185,000 shortfall because the budget he proposed in April projected revenue sharing to stay flat from the year before. City councilors, not wanting to raise taxes, have suggested eliminating all paving for next year, as well as not filling a public works position opening, cuts worth about $130,000. Morelli said paving is an easy target because it’s such a large amount. “Unfortunately, our roads are in pretty rough shape, so if there are alternatives to that, I want to at least explore them,” he said. Pittsfield Town Manager Kathryn Ruth said the town will freeze the budget, which will halt all town-funded capital projects, to absorb some of the $129,875 that the town stands to lose. She said the remainder will mean an increase in the tax rate. The town used to pave every year, but went to paving once every two years when the economy worsened five years ago, she said, adding that no paving this year will add to a growing deferred maintenance backlog that will be difficult to overcome, she said. Leaders in some towns, such as Madison, Norridgewock, Winslow and Winthrop said they’re not sure what to do, and that all options are on the table. Madison will lose $128,040, but Town Manager Dana Berry said he did not want to speculate on how the state budget would affect Madison residents before it is final. Winslow will lose $208,786, an amount Town Manager Michael Heavener said is mitigated by higher-than-expected property valuations, which will bring in about $55,000 more in revenue than the town budgeted for. Heavener said the town council will meet next month to discuss the options, which he said include a combination of tax increases, cuts and using the undesignated fund balance. He said the town has already used that fund balance significantly in recent years. In Norridgewock, which will lose $92,653, Town Manager Michelle Flewelling said the issue won’t have to be addressed immediately, because the towns uses a calendar year, rather than a fiscal year for budgeting. Next year, she said, the town will feel the loss, but she hopes that it will be mostly offset by new tax revenue generated by a natural gas pipeline that is expected to be constructed by Summit Natural Gas this year. She said the remainder could result in a tax increase. Winthrop Town Manager Jeff Woolston said town officials began developing a budget by assuming that all revenues would remain unchanged and setting a goal of reducing municipal spending by 5 percent. This year’s draft budget is $320,470, or 5.4 percent, lower. The Town Council may not have to change anything if the MMA projections are correct. Winthrop stands to receive $270,183 in revenue sharing, down from $406,239. “It still looks like, if nothing changes, that the municipal budget is still property tax-neutral,” Woolston said. The Town Council last week approved two continuing resolutions to fund the town government and Winthrop Public Schools at the current level until the end of July, to allow more time for the state budget to be set. In Fairfield, even if the Town Council agrees to take money from the undesignated fund balance, the short window of time it has could prevent that. 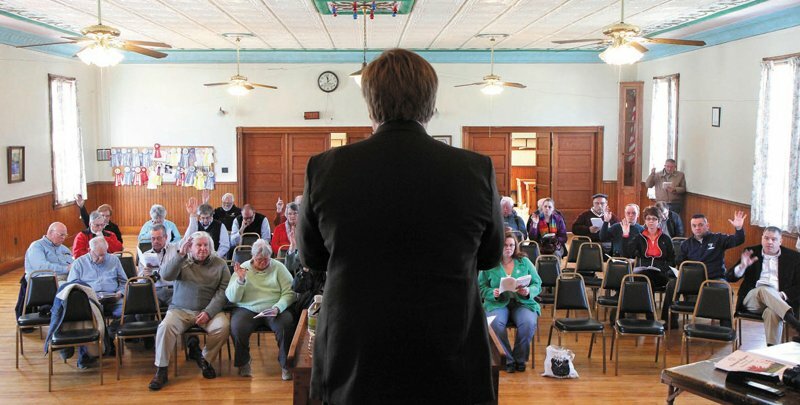 The special town must include 50 voting residents to be binding, a tall order in a town at which only 60 residents attended May’s Town Meeting. If not enough residents attend, Reny said, the town will not be authorized to touch the surplus account, which means that the $150,000 deficit would be raised through a property tax increase. Staff writers Amy Calder, Keith Edwards, Paul Koenig, Rachel Ohm, Kaitlin Schroeder, Susan McMillan and Jesse Scardina contributed to this report.